The Secretary-General of the Council of Ministers Dr. Mahdi Al-Alaq chaired the meeting of the Standing Committee for Coexistence and Peace of the Community to review the programs and projects carried out by the teams and their coordinators and the peace committees composed in all governorates during the past period to promote the concepts of peaceful coexistence, especially in liberated areas. The Secretary-General has prepared a detailed report on the overall activities and activities of the Committee, as well as the recommendations and proposals it has set for the Prime Minister, stressing that the dissemination and consolidation of a culture of dialogue, tolerance, respect for opinion, diversity, citizenship, respect for the law and all values ​​supportive of peaceful coexistence is a key factor in achieving stability. . 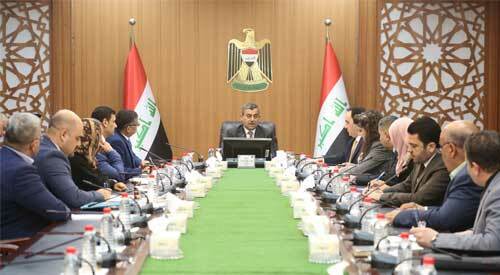 The committee also reviewed some of the administrative issues in a number of areas and identified ways to fight terrorism ideologically, intellectually and socially in coordination with relevant governmental institutions, local and international organizations and community elites. Discussed the challenges facing the implementation of the National Strategy for Coexistence and Community Peace.